Drew Troyer, an operator for Baker Hughes Inc., conducts a wireline survey on a Chesapeake Energy Corp. natural gas rig in the North Texas Barnett Shale bed rock deposit near Burleson, Texas, U.S.
Drillers pulled 25 oil and gas rigs out of service this week, the biggest drop since February 2016, the bottom of the last oil bust. The U.S. rig count dropped to 1,050, according to the Houston oilfield services company Baker Hughes. Of the 25 rigs lost, 21 of those were oil and four were gas. This marks the third straight weekly decline for oil rigs. 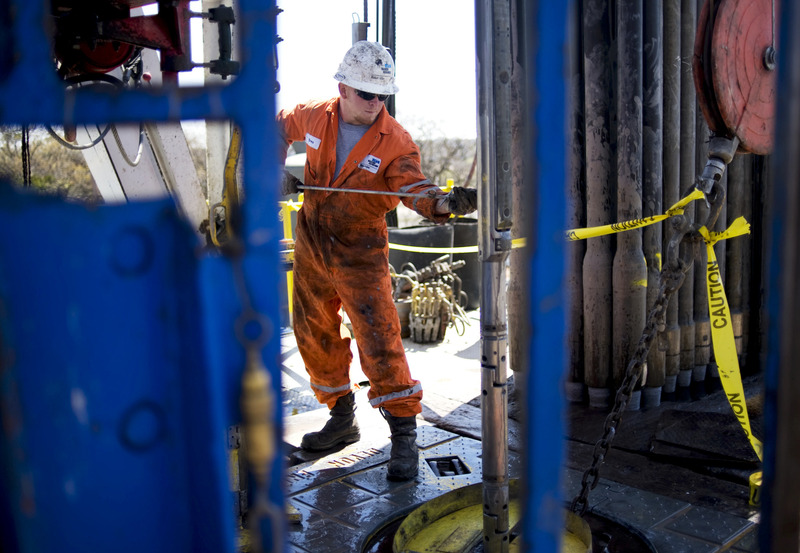 Texas lost 11 rigs this week, down to 521. Texas has the most oil and gas rigs of any state. Oklahoma, which has the second most rigs in the nation, lost 10 rigs this week. Both states drove the decrease nationally. Losing rigs than the nation can reflect reduced demand for oilfield services companies, which drill, frack and complete wells. Of the 25 lost this week, 19 were horizontal, which could indicate reduced fracking activity. Out of the 852 oil rigs in the U.S., well more than half of them – 481 – are situated in the Permian Basin. The west Texas oil field lost seven rigs this week. Last week, the U.S. rig count was unchanged. The oil rig count is down 47 percent from its peak of 1,609 in October 2014, before oil prices began to plummet. Oil climbed about 3 percent Friday, trading in New York at $53.92 a barrel 12:30 p.m. Central. It was over $60 per barrel a year ago.